Although Jews were known to have settled in Canada as early as 1760, the greatest wave of Jewish immigration into Canada occurred from late in the nineteenth century to the beginning of World War I. Like the United States, Canada received Jews of different religious and philosophical affiliations. There were the very religious and strictly Orthodox, as well as those who identified more with various intellectual ideas that they had learned about while in Europe, e.g. Marxism, socialism, Zionism, Bundism and anarchism. Just as in the United States, immigrants learned to assimilate, while at the same time building a cultural life for themselves that was familiar and comfortable. Like so many other immigrants however, Jews struggled financially as both individuals and as parts of companies or industries. Though many of the experiences of Jews in both Canada and the United States were similar, there were differences also. These differences were especially pronounced in the province of Quebec, e.g. there was a question in the early part of the twentieth century of whether Jewish children had the right to go to school in the Catholic or Protestant school system. This was only one of a number of situations that begged the question of whether a Jew's civil rights and social equality would be guaranteed. After 1901, Canada’s Jewish population stood at well over 16,000, with perhaps on average 6,000 Jews arriving every year afterwards. Jewish population in 1911 had reached almost 75,000. Over 18,000 Jews immigrated to Canada between 1913 and 1914. Even during the first world war, an average of 4,000 Jews were arriving yearly. There was another, smaller wave of Jewish immigration to Canada of Ukrainian, Polish and Lithuanian Jews that arrived in Canada in the 1920s. After the United States passed its Immigration Act of 1924, placing quotas on the number of immigrants they would allow in from different countries, immigration to Canada increased substantially through the end of the decade. There also was controversy with regard to immigration at the start of World War II. In 1939, a shipload of German Jewish refugees aboard the S.S. St. Louis were not allowed to disembark in a Canadian port and were forced to return to Europe. The record of Canada for receiving refugees during this time was very poor; during the Holocaust, Canada only admitted about five thousand Jews. Fortunately, this policy changed at the end of the war. In 1947, Canada allowed one thousand Jewish war orphans to immigrate into Canada. In the following year, immigration law was relaxed as Canada now needed more workers to fill the jobs that had been created as a result of a post-war, economic boom. There were, of course, many reasons that Jews immigrated to Canada, e.g. they wanted to be with family members had already settled there; they went for economic reasons, such as a better opportunity to earn a living. Also, many who had emigrated from Europe first entered North America through a Canadian port and decided to make Canada their new home. Whatever their reasons may have been, many of the new immigrants formed or joined landsmanshaftn, organizations consisting of landsleit, members who lived in the same home town. Many landsleit, once they arrived in Canada, formed a landsmanshaft which served a similar function as it did in their home town. These organizations were a great comfort to the new immigrant and helped them adapt more easily to their new home. Such landsmanshaftn provided support in many ways for their members, such as providing social opportunities, financial aid and also a burial plot for each member and their family when they needed one. 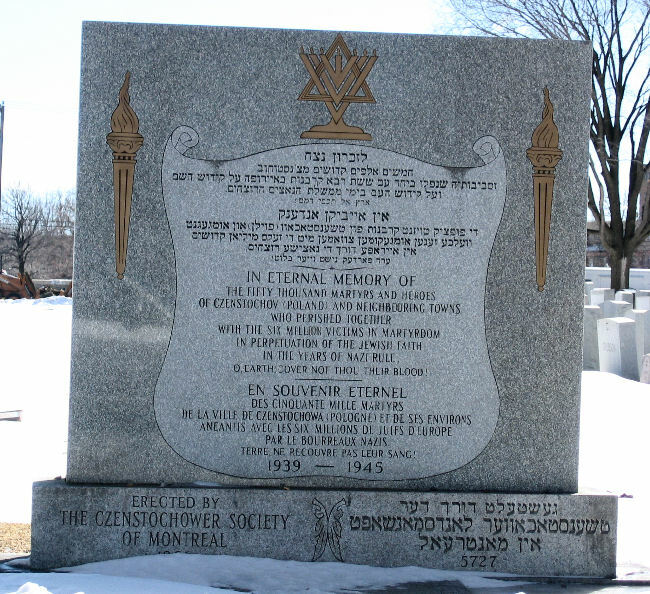 Many Jewish immigrants who now lived in Canada could only feel helpless during the Nazi onslaught, as many of their family members still remained in the towns and cities of Europe. So many of these family members, as well as entire communities, were lost. This exhibition is part of a more extensive and well-meant tribute to those individuals, families and communities who were tragically lost during these terrible times. En souvenir eternel. In eternal memory. May their souls be bound In eternal peace. We shall not forget! We shall not forget!